Research was conducted for this project by interviewing potential users about their navigation habits on the project pages of other portfolios in order to get a sense of their issues and needs. See the User Appendix at the bottom of the page for background information on each user. User 1 stated in the interview they don’t actually use this type of navigation much. Instead of project to project navigation they like to back out to the main gallery when they are finished with one project and select another. They liked to compare all the projects together in order to decide what to view next. Neither user enjoyed scrolling back up to the top once they were finished reading about a specific project. 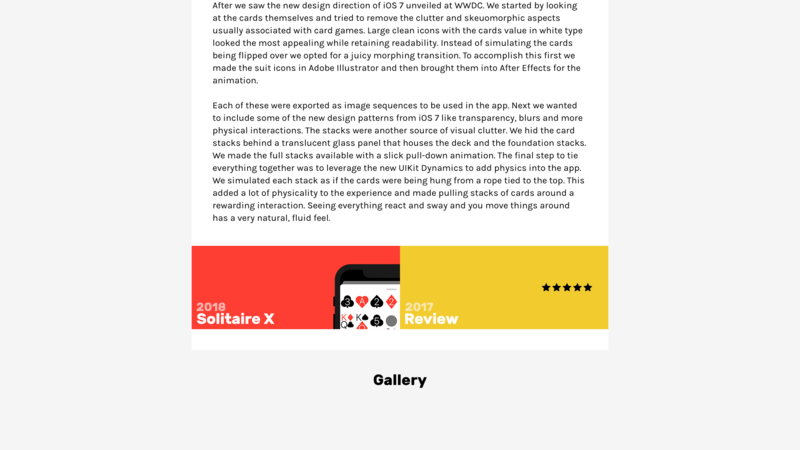 The feedback from User 1 proved valuable in determining that some users do like navigating back out to the gallery and back in to a project. A Back to Gallery button was included for this reason. Above that are the older and newer projects adjacent to the current one in chronological order. This easily allows users to navigate the collection over time. The background for the two navigation buttons is pulled from the key color for the project (the same colour as the background on the gallery page) in order to strengthen the users familiarity with each project since the key image is not used here. Users of the site will build up associations of the project to the key colour through its ubiquitous use. The fonts were an easy choice. The rest of the website uses Rubik in various weights for headings and Karla for content so Rubik Bold was chosen here for consistency. The project title text has a large 36 point size leaving plenty of space on the side for visual breathing room as well as potential compression for mobile layouts. The year text has a smaller 26 point size and only has a 70% opacity in order to deprioritize it and maintain visual hierarchy. Finally, the return to gallery link uses a similar 36 point Rubik Bold but is positioned off of the “page” (the lighter centered rectangle that holds the content) in order to indicate that this link is separate from the project contents and is more of a “meta” link and relates to website navigation rather than a link in the content. This is further emphasized by the link not getting the key colour treatment that links in the page content get. The primary goal for this design is to encourage exploration. In particular this design addresses users without an end goal. Since this feature just adds more links to other pages, there isn’t a negative effect to be measured. Instead, the test is designed more around how useful the design is. This test simply asks users to explore the site for 3 minutes and everytime they use one of the new navigation links it is recorded. This should give a good idea of how much use the feature will get. See the User Appendix at the bottom of the page for background information on the user testing group. While it may be difficult to derive meaning from these numbers there are a couple of key insights. Every user used the links at least once which is a good sign that the design is providing utility to every user. While watching the test it also became clear that the links help let the user flow through the content in a more natural way. For example instead of scrolling back up and then clicking back after reading a page, users were flowing right into the next piece of content or back to the gallery directly from where they are. Based on the feedback provided by Katherine a revised design was created. To address her suggestions I changed the design of the links to include the key images from the main gallery page to add variety. The suggestion to make the bottom section a scrolling timeline is very good however it would require a radical redesign of this component and is out of the scope of this design. 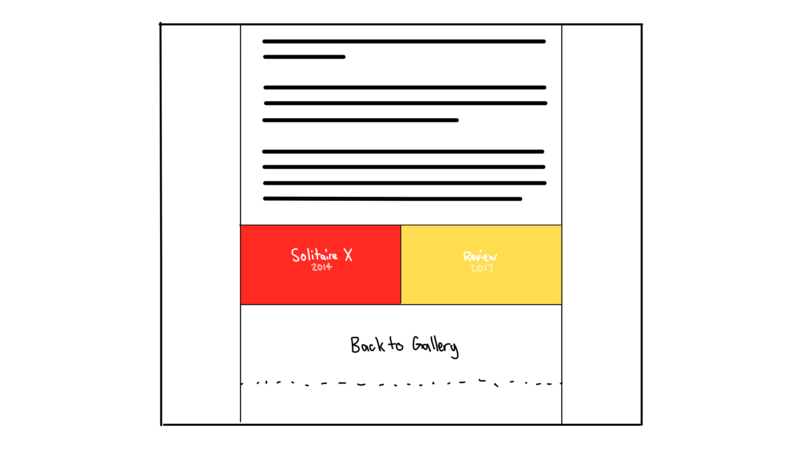 By adding the key images and rearranging the text to better resemble the layout of the gallery hover design, it reenforces the connection between the colour, image and title and enhances the consistency across the site while adding some extra flair to these links.